As of Monday, September 18, 2017 the drop-off only mixed rigid plastic recycling program has been suspended. The rigid plastic recycling dumpsters have been removed from the drop-off sites with no timetable for their return. These are plastic items like children's toys, 5-gallon buckets, and other sturdy plastic items that are inappropriate for your recycling cart at home. Are there any other changes to recycling? No. The only change is the suspension of the rigid plastic program. Everything that could go into your green recycling cart can still go there. Why was the rigid plastic program suspended? This change is due to an import restrictions enacted by China for scrap material. At present, there is no end market to accept the type of plastic scrap the mixed rigid plastic program produces. Therefore, the program must be suspended. When another market becomes available, the rigid plastic recycling program will restart. what do i do with this stuff now? If the rigid plastic items you have are still usable, consider donating them to thrift stores or other organizations that accept donations of used goods. 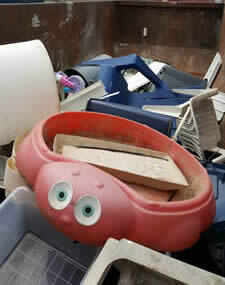 This extends the life of plastic items, keeping them out of our landfills as long as possible. There are several options for this in Madison. Also, do not forget to try your social networks, such as your neighborhood Facebook page, to see if the item can be used again by someone at your work, school, or community. Embrace your creativity, too. Plastic kitty litter buckets make a great container for sand in the winter to spread on your sidewalks. Maybe that old cooler would make for a unique planter in the spring. If the item can not be reused, resold, or donated, then the rigid plastic item would need to be placed into the refuse or set out for large item collection. And you may want to think twice about purchasing rigid plastic items if it can be helped, especially if the item will only be used for a short time. Creating less waste is always the best solution for environmental questions. If you have questions or need additional information contact the recycling coordinator at (608) 267-2626.